An eighth inning rally helped the Catholic University baseball team overcome three run deficits and brought its record to 22-9 (9-6). The team sits on top of the Landmark Conference thanks to a tiebreaker over the Moravian Greyhounds, whose overall record sits at 16-15 (9-6). The Cardinals triumphed over the Stevenson Mustangs 10-6 in the road non-conference matchup, making it their 3rd win in their last 4 games. The Cards got behind early in the game, giving up one run on a sacrifice fly in the bottom of the first inning. They managed to jump out to a one run lead of their own at the top of the second inning, when catcher Will Pyne drove in sophomore Connor Cozad on a fielder’s choice and then scored on a single to center from second basemen Ryan Tracy. Tracy would go 5-for-5 on the day, hitting two doubles, driving in 4 RBIs, and scoring twice. Stevenson managed to regain the lead by scoring 3 runs in the bottom of the third to make the game 4-2. Catholic would go on to grab one more run in the fourth before Stevenson scored 2 more in the fifth to make the game 6-3 until the fireworks of the eighth frame began. Cozad began the inning with a walk off single to right, forcing the first of 2 pitching changes made by the Mustangs in the inning. Classmate Connor Sullivan reached first on a bunt and ran safe to second on a throwing error by the second baseman, which allowed Cozad to score from first. Junior catcher Sean Dempsey also reached on a bunt to set up a 2 RBI double from Tracy. A single from senior Jake Crist drove in 2 runs to give Catholic the go ahead lead of 8-6. Tracy was not the only standout batting performance for CUA as Crist and junior outfielder Bailey Lewis each had 2 RBIs on the night while Sullivan went 3-for-5 at the plate. 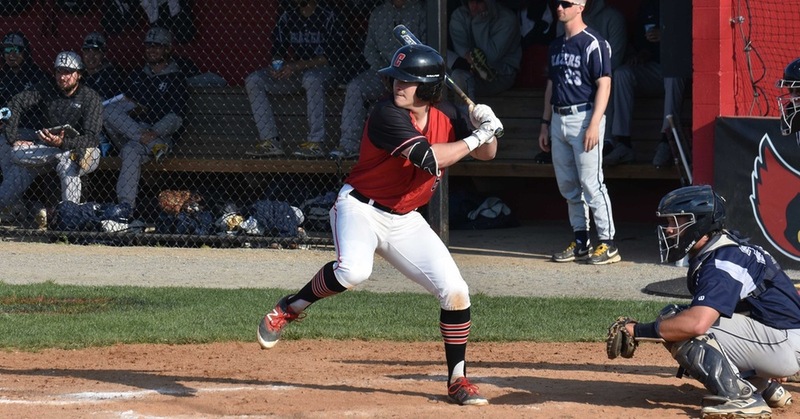 CUA would score twice more in the top of the ninth when Tracy scored his final RBI on a double and was scored on a single from Lewis, making the final score 10-6. The Cardinals’ baseball team returns to action this coming weekend as it hosts Juniata College for a three-game series. The Saturday, April 21st game is set to begin at 12:30 PM while the final leg on Sunday begins at noon. This is the final Landmark Conference series of the season for the team and could secure homefield advantage throughout the post-season with multiple wins.